We propose that CR inhibits seizure susceptibility by shifting brain energy metabolism from glucose to ketone bodies. A CR-induced reduction in glucose utilization and increase in ketone utilization will, on the one hand, reduce the glycolytic energy reserves related to seizure activity and, simultaneously, decrease neuronal excitability through ketone metabolism. This involves multiple metabolic changes that would ultimately shift the neural environment from excitation to inhibition. An outline of these changes (Fig. 8) was recently presented in relation to metabolic control theory for the management of epilepsy (11). The brain derives almost all its energy from the aerobic oxidation of glucose under normal physiological conditions. Glucose transporters, e.g., GLUT 1, are enriched in the brain capillary endothelial cells and mediate the diffusion of glucose through the blood-brain barrier (Fig. 8). Most of the glucose is metabolized to pyruvate, which enters the mitochondria of neurons and glia and is converted to acetyl-coenzyme A (CoA) before entering the tricarboxylic acid (TCA) cycle. Only a small amount of the pyruvate is converted to lactate under normal conditions (13). Fig. 8. Perspectives on the metabolic management of epilepsy through a dietary reduction of glucose and elevation of ketone bodies. 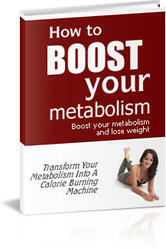 A dietary reduction in blood glucose levels will increase ketone utilization. This is expected to shift the neural environment from excitation to inhibition (see text). Abbreviations: GLUT-1 (glucose transporter), MCT (monocarboxylate transporter), PFK (phospho-fructokinase), PDH (pyruvate dehydrogenase), SCOT (succinyl-CoA-acetoacetate-CoA transferase), P-OHB (P-hydroxybutyrate), GABA (y-aminobutyric acid). tic activity, and seizures are associated with enhanced glycolysis (82-86). Brain lactate levels also increase significantly during seizure activity (87,88). The seizure-associated lactate increase reflects the rapid increase in glycolytic rate over the cerebral metabolic rate of oxygen, and the maximally activated pyruvate dehydrogenase is the rate-limiting step (81). The pyruvate dehydrogenase fails to metabolize pyruvate to acetyl-CoA at the same rate that pyruvate is produced. Hence, lactate dehydrogenase converts pyruvate to lactate during periods of oxygen deprivation and rapid glucose metabolism, as would occur during epileptic seizures. Studies indicate that CR downregulates glycolytic enzyme and gene expression in mouse tissues (89,90). Although CR will increase the total energy available to the brain through ketone body metabolism, it will reduce the energy available from glycolysis (50,91). Reduced glycolytic energy could deplete the reserves of immediately available energy necessary for seizure initiation and spread. It is not yet clear, however, to what extent enhanced glycolysis is related to the cause or effects of seizure activity (11). Although glucose is the preferred metabolic fuel, the mammalian brain will metabolize ketone bodies for energy when blood glucose levels decrease, as during fasting or CR (13). The transport of ketones into the brain occurs through the blood-brain barrier monocarboxylic transporter (MCT-1), whose expression is regulated in part by circulating ketone and glucose levels (92-94). 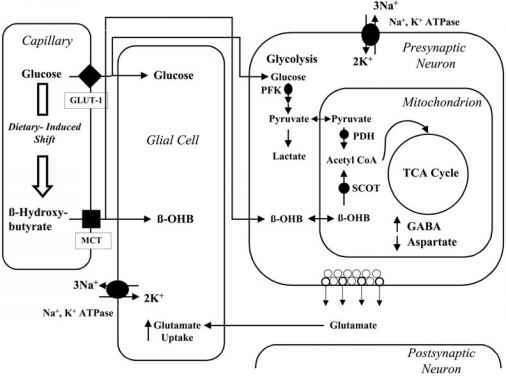 Ketone bodies, being metabolized directly to acetyl-CoA in the mitochondria, bypass cytoplasmic glycolysis and provide brain energy directly through the Krebs cycle (37,50,95) (Fig. 8). Reduced blood glucose and increased blood ketone levels may be needed to induce the activity of succinyl-CoA-acetoacetate-CoA transferase (SCOT), a key enzyme required for ketone body metabolism (20,96). 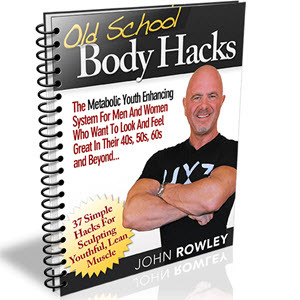 In addition to reducing glycolytic energy, ketone body metabolism causes significant increases in the TCA cycle metabolites (from citrate to a-ketoglutarate) and improves metabolic efficiency through an increase in the energy of adenosine triphos-phate (ATP) hydrolysis (50,51,97). Thus, a shift in energy metabolism from glucose utilization to ketone utilization could contribute in part to a mechanism by which CR inhibits seizure susceptibility in EL mice. The metabolism of ketones for energy would also produce multiple changes in the content and distribution of brain neurotransmitters. Ketones stimulate glutamic acid decarboxylase activity that can potentially elevate y-aminobutyric acid (GABA) content in synaptosomes (98-100). Ketone-induced alterations in TCA cycle metabolites will favor the formation of glutamate over aspartate, thereby reducing brain aspartate, an excitatory neurotransmitter implicated in EL epilepsy (50,63,64,100). Ketone body metabolism could also increase the activity of the sodium pump in both neurons and glia (50,101) (Figure 8). Increased pump activity in neurons could increase the membrane potential, thereby decreasing neuronal excitability (30,50,80,102). Increased pump activity in astroglia, on the other hand, could facilitate glutamate uptake following synaptic release, thereby reducing the duration or spread of seizure activity (81,103,104). Another effect of prolonged fasting or CR would be a reduction in the cerebral metabolic rate of glucose (105). Generally cerebral energy metabolism shifts from glucose to ketone utilization in humans in approx 3-4 d (20). This period closely parallels that required for seizure control through fasting (Figure 1). CR also elevates circulating glu-cocorticoids that would further reduce cerebral glucose utilization (49,106). The brain will metabolize ketones for energy more effectively under reduced glucose than under high glucose conditions because reduced glucose stimulates ketone body metabolism and utilization (as a substitute for glucose) (13,14,20,107). A gradual reduction in blood glucose will force the brain to use ketone bodies as an alternative energy fuel (107). The shift from glucose to ketone metabolism will increase brain ATP and citrate levels, which will inhibit phosphofructokinase and further reduce glycolytic energy (91,105). Slight to moderate shifts in energy metabolism from glucose to ketones would produce global changes in brain excitability that could potentially suppress seizure activity (11).